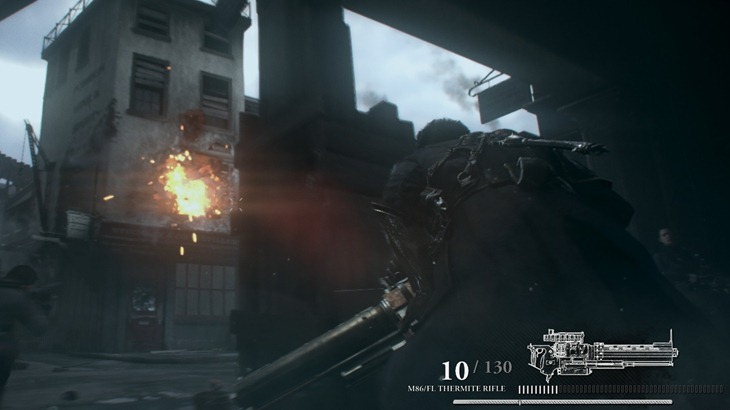 The Order 1886 is one of the stranger new-gen games on the way. On paper, it looks like your standard cover-based shooter, but it has an absolutely magnificent visual style, squeezing all the action into a 16:9 anamorphic ratio. That creates a very cinematic look for the game. And right now, it looks even better in the graphics department. Sony streamed some new gameplay of The Order 1866 over on the weekend. Here’s that footage, albeit slightly choppy. Sorry about that lads. So the game looks good, and the combat looks solid. But The Order 1886 is going to need more than that in order to succeed. As a potential franchise, it’s going to be going head to head eventually with the father of that genre in the recent age, Gears of War. Both games are entirely different specimens, but the core basics are there. Conveniently placed areas with which to hide behind and peek out from, guns, explosions and enough bullets to level Stalingrad several times over. Of course, both titles are console exclusive, but it’ll still be interesting to see how they stack up in the long run in terms of fanbases and sales. There’s no definite release date for The Order 1866, with it currently listed as a Q4 game for 2014, but my spidey-senses reckon it’ll be delayed into 2015 due to the absolutely massive upcoming silly season glut of games.